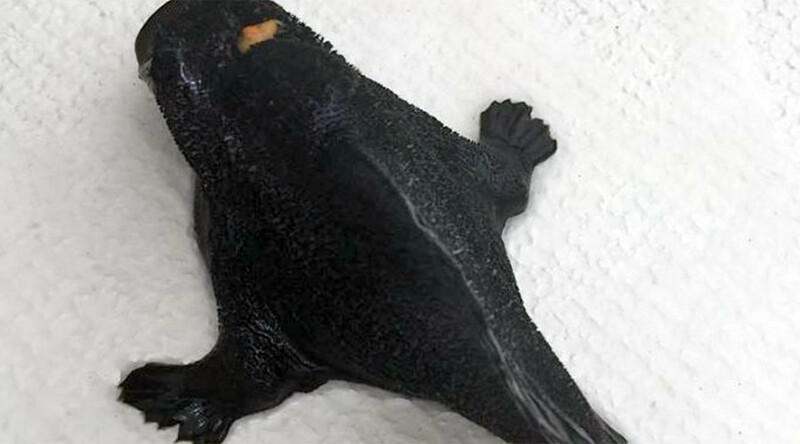 An unusual sea creature that looks like a strange hybrid of frog and fish and even has some bird like resemblance at a certain angle, has washed up on New Zealand’s North Island. The creature was found in shallow waters in the Bay of Islands by Claudia Howse, Glenys Howse and James Beuvink but didn’t survive after being caught. They contacted the Museum of New Zealand Te Papa in Wellington who are working to identify the black critter. The museum posted images on their Facebook page sparking up some online conversation on what the “walking fish” could be. Social media users’ suggestions ranged from a “toothless dragon” to an “alien”. Experts disagree and so far believe the most likely answer is a species of frogfish. Tests are underway to make a positive identification. “Frogfishes have the fastest bite of any vertebrate. Their mouths expand at the speed approaching a .22 rifle bullet - and that's in a medium 800 times denser than air,” the museum explained in a Facebook post. They live in almost all tropical and subtropical oceans and seas around the world, including the northern tip of New Zealand but few traces of them remain in fossil record. Generally they lie on the ocean floor around coral or rock reefs, not moving very much but waiting for prey.